Refrigerators are the focal appliances of every kitchen. When they malfunction, they cause serious problems. With our rapid Markham refrigerator repair service, any trouble will be taken care of. We fix any fridge brand and the most innovative models. Do you need French-door fridge repairs? Want to service your top or bottom mount fridge? You can depend on the expertise and skills of our techs. And you can expect our immediate support should your fridge breaks down. Appliance Repair Markham will cover your service needs in a timely manner. Your fridge is one of the most tireless appliances at home. Both fridges & freezers work non-stop to preserve diaries, meat, ice cream, cooked meals, and anything else you keep in your appliances. So their preservation is questioned when the refrigerator or freezer doesn’t work or fails to keep the ideal temperatures. That’s when we step in. Our kitchen appliance specialists are geared with the right diagnostic and refrigerator repair equipment to do any service properly. Markham, Ontario. The technicians of our company are well trained and have the qualifications to service all home fridges. It doesn’t make a difference if you have French-door fridges or side-by-side models. Our expertise is ensured. The mission of all fridges is to keep food and drinks below room temperatures. If they fail to do so, we take care of them. Our techs use the refrigerator repair parts they keep in their service vans to replace the damaged coils, thermostats, door gaskets, water filters, and other components. The response of our refrigerator service technicians is quick when you need repairs. But we are also fast when you want to maintain your appliance. Why is fridge maintenance important, you ask? Just the debris that builds up on the appliance’s coils is enough to compromise good refrigeration. We clean the coils, check the thermostat, and inspect any other component to ensure the good performance of your fridge. This way, we spare you from extra expenses and hassle. 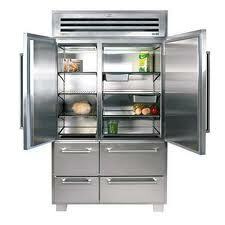 The fridge consumes a lot of energy and will consume even more if its door gasket is torn. If there are broken parts or the appliance is not leveled, it might leak. So call us today for any refrigerator repair Markham service.